House of Cards had to address Kevin Spacey’s shameful exit following allegations of sexual misconduct somehow, and by the looks of it, the show isn’t wasting any more time with its disgraced former star in its final season. Clocking in at just about 20 seconds of actual footage, a new teaser released Wednesday unequivocally answers any looming questions about how the show will deal with its Kevin Spacey situation, which delayed production on the show’s sixth and final season until earlier this year. “I’ll tell you this Francis, when they bury me, it won’t be in my backyard. And when they pay their respects, they’ll have to wait in line,” says Robin Wright’s Claire Underwood—Frank’s wife, First Lady, Vice President, and now his successor as President on the show. She then turns to the camera, and in one of the show’s signature fourth wall-breaking moments, and one most associated with Frank Underwood on the show, leaving viewers with a cold stare. The shortened final season will run eight episodes, as opposed to the typical 13, which leaves House of Cards with only so much runway to conclude its story of unchecked Washington sabotage and ambition. And if the new teaser is any indication, the show is going to dispose of its real-world scandal with the same ruthlessness with which the Underwoods dispatch their political rivals. Wright has recently come under fire after a Net-a-Porter interview in which she suggested that Spacey deserves a “second chance,” but toxic men in Hollywood have already gotten more than a few of those. 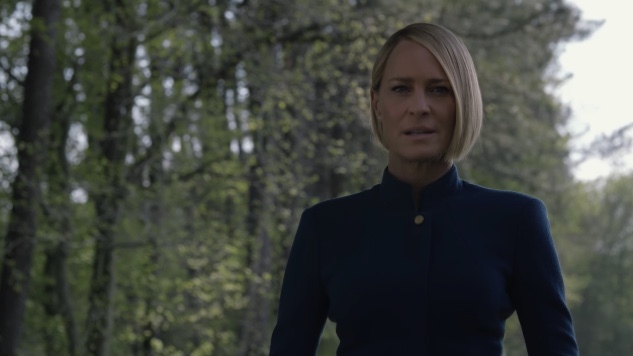 Claire Underwood is by no means a role model, but perhaps Wright would be better served cutting ties with her former co-star once and for all, as House of Cards itself so emphatically has. The final season of House of Cards premieres on Netflix on Nov. 2.